WASHINGTON (ABC7) — Battling ropes and kettlebells might sound a little intimidating when it comes to expanding your exercise routine. So fitness instructor Annabell Browne stopped by for workout Wednesday to ease us into a new world building strength. Today, local Kettlebell expert and group fitness trainer with DC’s Fitness Snob Anabell Brown was here with us today to show parents how they can develop an easy fitness routine now that kids are back in school. Annabell Browne joined Holly Morris to demonstrate the best kettle bell movements to help you fit throughout the winter months. 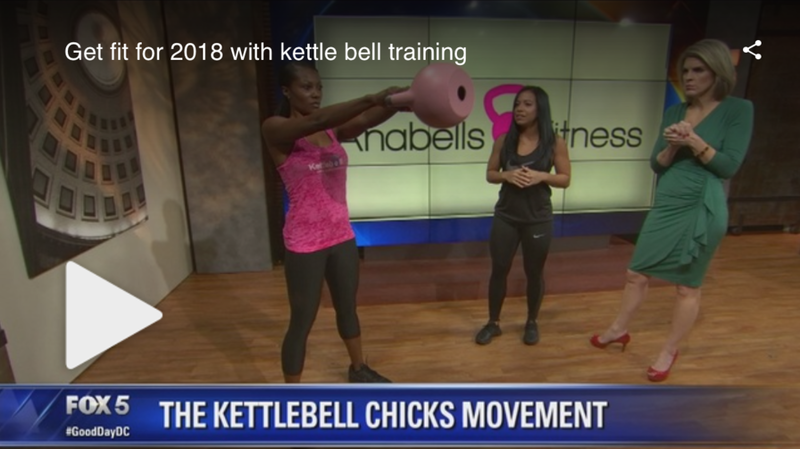 Ana Browne, Owner of Anabells Fitness LLC, joined Roland Martin on NewsOne Now to share how adding kettlebells to your workout can take your exercise routine to the next level. Browne explained kettlebells are primarily used for functional fitness training and combining both strength and cardio at the same time. Use of kettlebells incorporates your grip strength, as well as your hand/eye coordination and focuses on endurance and stamina training. About Ana: Ana has the privilege of working along side Jeff Martone, a well-known leader in the Kettlebell industry. Ana works as Jeff's assistant when he is conducting his Kettlebell certifications. Through years of working with Jeff, Ana has gained an extensive knowledge of perfecting ones Kettlebell technique and form as well as being able to work around injuries. Through years of experience training herself and others to meet various fitness goals, Ana has become a diverse trainer with a complete understanding of the word DISCIPLINE. Ana was kind enough to answer a few questions for us in the latest installment of our Featured Fitness Instructor series. Here’s something scary to think about: Bathing suit season is just a bit more than two months away. We turned to local personal trainer Ana Browne to get our abs into tip-top shape by demonstrating four one-of-a-kind core exercises to incorporate into our workouts. And you can trust they’ll work—Browne competes in national bikini-body competitions. Lie down on a yoga mat holding two dumbbells over your chest. Raise and extend legs so your body forms an L-shape. Slowly shift your legs from left to right, mimicking windshield wipers. Perform for 1 minute. Beginner: Perform without dumbbells and place hands off to side with palms down. Intermediate: Hold two medium-weight dumbbells for 1 minute. Advanced: Aim for feet to touch the floor when tapping side to side for 2 minutes. Ana Browne of Anabells Fitness is a former college basketball player who turned her years of athletic experience into a full-time job. These days, she’s running around the Washington region as a personal trainer certified in kettlebell training, TRX Suspension trainers, battling ropes, and flexibility training, to name a few. Read on to see how the busy bee stays on track with multiple small meals. “I’m always on the run for work with clients, so here’s something quick with a lot of flavor.” One cup of Greek yogurt, three strawberries, and half a cup of granola. “Taking advantage of foods that are in season is a fun and healthy way to add some color to your meals.” Two hardboiled eggs with baked sweet potato, asparagus, and butternut squash. How do people who put in long days and sometimes uncertain hours manage to stay fit? Local movers and shakers share their routines. Work schedule: Palka starts looking at various meteorological websites and weather models as soon as she wakes up at about 9 a.m. She’s at the office from 3:30 to 11:30 p.m., with longer hours during major weather events, and often doesn’t get to bed until 1:30 a.m. Workout of choice: “Anything I can do in a 10-by-10 foot space” in her neighborhood’s small fitness center between noon and 1 p.m. three or four times a week. That includes exercises Palka learned from Germantown trainer Ana Browne, who introduced her to kettlebells, cast-iron weights that look like cannonballs with handles, during their weekly sessions. Palka also uses the elliptical trainer and the treadmill, and sometimes runs or bikes around her neighborhood. Last August she ran in the Charlottesville Women’s Four Miler.